My wish for 2019 is that it is a brilliant year for not only KEK but also you. 2019 marks the end of the Heisei era and the beginning of a new one that will allow KEK to shine. I feel like KEK has been in a dim tunnel the past several years, but last year we finally started to see some light. I am optimistic that due to progress in research and the future of KEK, this new era will be immersed in light. Here I would like to focus on our research plan and the impact of the Ministry of Education, Culture, Sports, Science and Technology (MEXT)’s new policy. Our research plans to two priorities. The first is the Super Kamiokande Plan, which is a collaboration with The University of Tokyo. The second is participation in the High-Luminosity LHC (HL-LHC) project led by CERN (the European Organization for Nuclear Research). These priority plans have been featured in the road map for large scientific research issued by MEXT. In 2017, MEXT issued a new policy for large scientific frontier projects. Thanks to MEXT’s new policy, KEK’s priority plans have successfully advanced. Our HL-LHC project has a dully allocated budget by the government for fiscal year 2019. Hence, we aim to complete the project as planned. 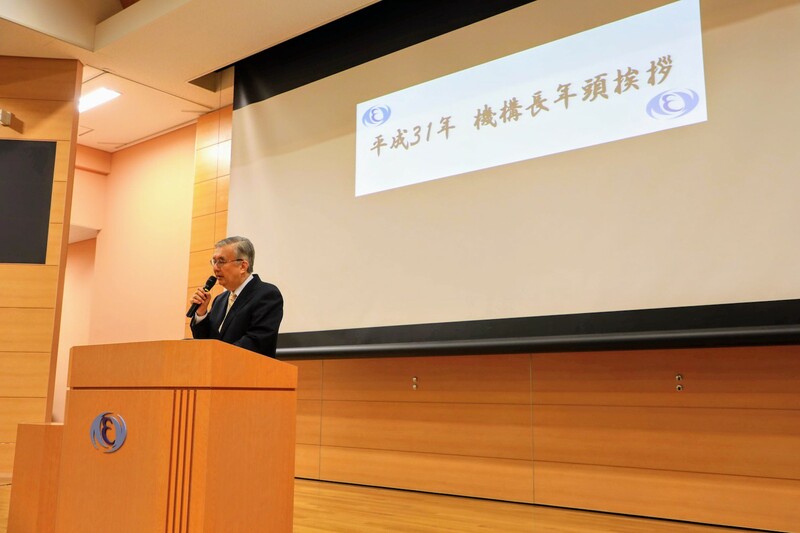 Although the budget for Hyper Kamiokande has not been approved for fiscal year 2019 due to its large budget size, MEXT continues to discuss this as part of the research plan of The University of Tokyo. Thus, 2019 should be a crucial stage for the appropriations of the Hyper Kamiokande project. As KEK’s priority plans progress, we have had opportunities to address the extensions of Muon g-2 experiment facility and Hadron Hall, which are our second priorities, much earlier than anticipated. This is a significant change because our new research plans have started to advance thanks to MEXT’s new policy. Based on this change in circumstance, I strive to promote KEK’s research plans together with you. On the other hand, the future of KEK’s synchrotron radiation facility is a major concern. As the SLiT-J (Synchrotron Light in Tohoku) plan advances, the acceptance of a new academic synchrotron radiation facility becomes more difficult. Hence, an urgent task is to evaluate which KEK research plan to launch as the SLiT-J plan progresses and once it is complete. In 2018, a significant change was made in the budgets of KEK’s ongoing projects. This was in response to MEXT’s new policy to promote new projects among large frontier research. As a result, the contrast in the budget allocation has been strengthened. Specifically, KEK has prioritized its budget to SuperKEKB, J-PARC Main Ring power source, and HL-LHC, while those for operations of the synchrotron radiation facility and J-PARC have been reduced more severely than expected. Great wisdom, including a paradigm shift in thinking, is needed with respect to the operation plan beginning in fiscal year 2019. I will deliberately develop future plans in partnership with concerned members. Regarding project budgets, it is important that you understand the impact on research. To date, regular and long-period operations of facilities, which allow us to serve as joint-use facilities and to earn outcomes, has been one of KEK’s styles. However, now is the time to adopt a new style in which we operate some facilities for a certain period to produce research outcomes. Then we move to the stage where only projects that produce significant outcomes will continue. Namely, research projects will undergo selection process as this aligns with the budget constraints that society will accept and support. In particular, for synchrotron radiation facilities, a large-scale strategy, which specifies target outcomes and identifies facilities that will be used to achieve the outcomes, must be developed by reviewing the products generated during KEK’s 35-year operation history. 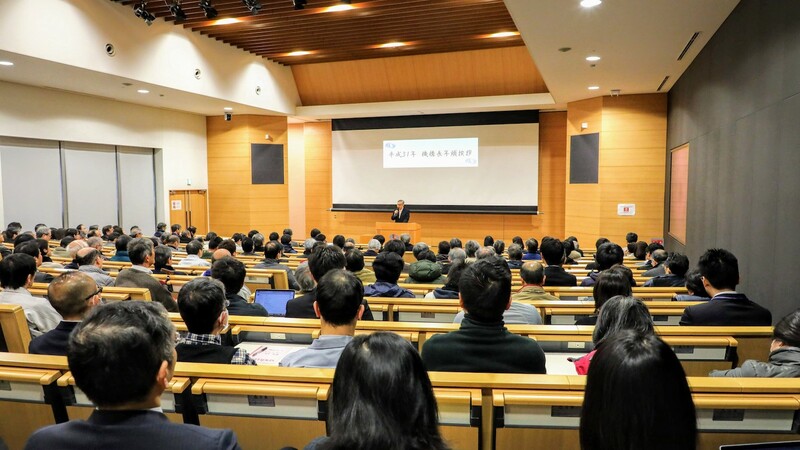 Although it is necessary for J-PARC to develop a large-sized strategy, its strategy must be very wise, considering J-PARC will be conducting neutrino experiments that involve Hyper-Kamiokande as well as research projects at Material and Life science Experimental Facility (MFL) and Hadron Hall. Another big movement is the International Linear Collider, ILC. This is a project strongly recommended by the world’s high-energy physics community, and is not a KEK’s individual project plan. As such, KEK has contributed to the promotion of ILC by helping the Japanese government (MEXT) as a core institute of the host country. Last summer, the ILC Advisory Panel established by MEXT issued their findings on ILC. Then the Science Council of Japan continued the discussion of the ILC and issued their report. Due to the mass-media attention, you may already know the Council’s conclusions were not completely favorable as they noted the academic significance of the ILC, but did not recommend supporting the current vision. I think we should sincerely hear how they reached their conclusion and apply lessons learned the future opportunities. However, all is not lost. We requested that the government not make a final decision on the ILC, but instead start an international discussion. The next step should be policy statement by the government. I anticipate this will be released at the beginning of March. Between now and then, I would like to strength our activities. Hence, there is some positive movement on the ILC after a period stagnation, making me strongly believe that the light at the end of the tunnel is near. Such big changes have not only affected our research plans, but have also initiated a big transformation on the national universities front: Inter-University Research Institute Corporations. How should such Corporations transform as organizations equivalent to universities? Especially, under the current situation where the subsidence in Japanese scientific research has significantly progressed but the outlook for Japan’s continued economic growth is not as bright, a major theme is how will Inter-University Research Institute Corporations play a leading role in scientific research in Japan? 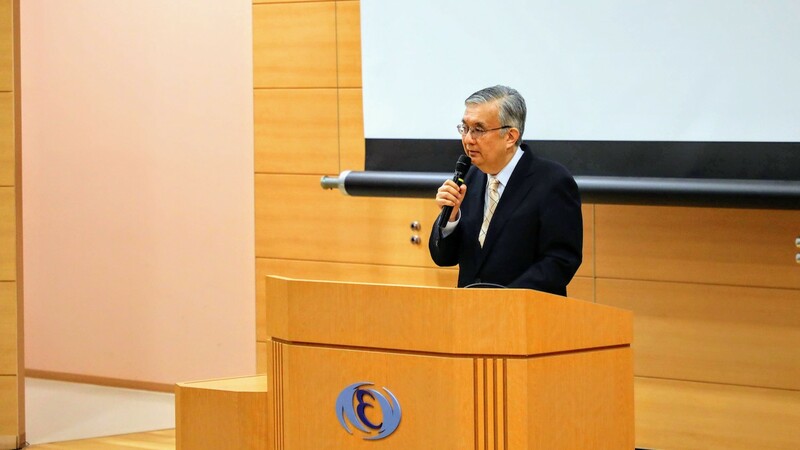 As part of the transformation, the possibility of integrating the existing four Inter-University Research Institute Corporations was discussed, but KEK was opposed to this idea. As a result of discussions that spanned over seven months in the Committee on Research Environment, one of Councils of MEXT, it was determined to initiate two reformations instead of integrating the four Corporations. The first reformation is to improve the efficiency of the Corporations by establishing an organization composed of the four Corporations and SOKENDAI to streamline the four Corporations’ operations through various efforts (e.g., standardizing work processes much as possible). This organization is now tentatively called “Union,”. The second transformation is to make the Inter-University Research Institute Corporations more dynamic. For this purpose, the four Corporations will be reviewed with the possibility of reorganization and integration every six years. Additionally, the scheme and conditions for organizational conversions between Institutes affiliated to universities and Inter-University Research Institute Corporations have been clarified. These efforts have realized a more dynamic Inter-University Research Institute Corporation system but did not maintain the Corporations as initially intended. However, I accept such a dynamic system positively. In addition to the selection of research, which I referred above, this dynamic system seems to offer something akin to the evolution of living things, where evolution is achieved by changes and selection. I have learned a lot through discussions related to this reformation. Here is a brief summary of my conclusions on the reformation strategy. First, there are very high expectations for Inter-University Research Institute Corporations. In particular, many persons wish to strengthen the Corporations so that they will be able to assume the lead in combating the scientific subsidence. Meanwhile, universities expect to utilize the Corporations as a tool to drastically improve their functions of research and international collaborations. Now I strongly believe that an Inter-University Research Institute Corporation can meet such expectations. Additionally, I learned the role that KEK has to play as a member of society. We must put more efforts in the development of personnel who can contribute to Society5.0 and the production of research outcomes that have practical applications. KEK’s challenge is to determine how we can meet such necessities while centering on fundamental research. Furthermore, whether Inter-University Research Institute Corporation is the right organization to perform such tasks must be reconsidered. The new direction of KEK must become visible gradually. However, this means that KEK must overcome major changes simultaneously. Changes cause inevitable stress to both individuals and an organization. Just as the repetition of “environmental change + mutation + survival of the fittest” is the evolutionary process of living things, we should also strive for the proper way to evolve and use environmental changes as an opportunity to leap forward. In closing, I would like every KEK member to pledge to make 2019 the year of actively supporting human beings’ intellectual exploration. I along with the Director Generals promise to make our best efforts to support in you in this endeavor.